I can’t help but view the image above and think of 2001, with some impenetrable black slab tilted horizontally and laid upon the city. The sign, which comes from Toronto, has been the source of some puzzlement over its origin or purpose — maybe someone in actual authority can provide the final answer as to what this signage means and why it needs to be in place (although, I will admit, the sign gains in strange, mythic stature the less one knows about it). It seems to have something to do with plowing — and monolithic refers to its construction — but are sidewalks plowed by trucks? (and if it’s plowed in the way the above image suggests, wouldn’t that dump a bunch of snow on that very sidewalk?) Why only a monolithic sidewalk there, and not anywhere else? 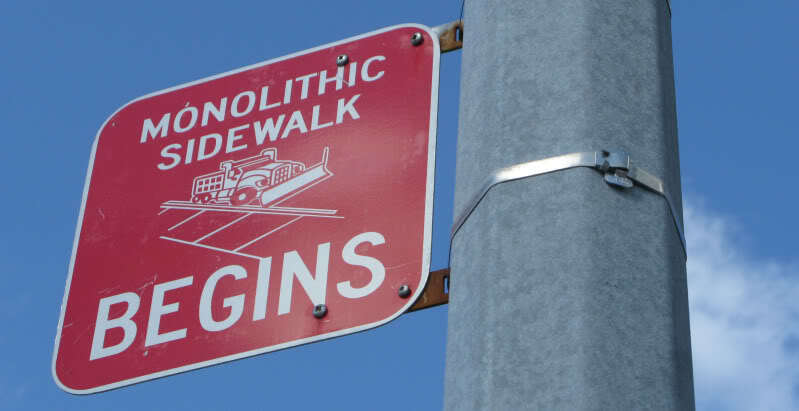 What’s a non-monolithic sidewalk called? And as reader Bruce notes, the sign has even prompted a searching inquiry into self-effacing signage and Canadian national identity. This entry was posted on Friday, January 29th, 2010 at 11:23 am	and is filed under Traffic Psychology. You can follow any responses to this entry through the RSS 2.0 feed. Both comments and pings are currently closed.